Every few months or so I get the urge to do some really complicated nail art. Something that will really challenge me and push my boundaries (and that will likely take a few hours). A couple of nights ago, I had one of those urges. I was thinking about how badly I wanted to play Mario Party (I'm all about the minigames) and I thought it would be fun to do characters from the Mario universe! Plus, who doesn't love a good bit of geekiness every now and then? 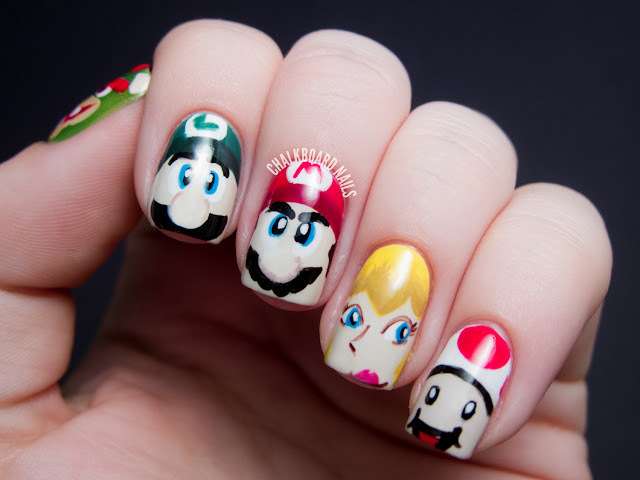 For the good guys, I chose to include Mario (mega duh), Luigi (also duh), Peach (duh), and Toad. It was tough cutting Yoshi from the lineup but I have a soft spot for that little mushroom headed nerd. Peach was strangely the hardest to paint. I ended up redoing her two or three times before I was happy enough to keep it, and even now she is one of my least favorite nails in the lineup. It's kind of a bummer because I really like her as a character. At least the pointy bangs help identify her! I am most happy with how Mario and Luigi came out, which is surprising, because I was fully expecting them to be the hardest and look the strangest. I won't look a gift horse in the mouth though! Then of course I had to include Bowser. Bowser, like Peach, was really tricky to portray correctly. I think he looks a tiny bit different than the rest of the characters, stylistically, but I don't mind so much. Of course I did mix in some other shades to get the variations just right but you get the idea! 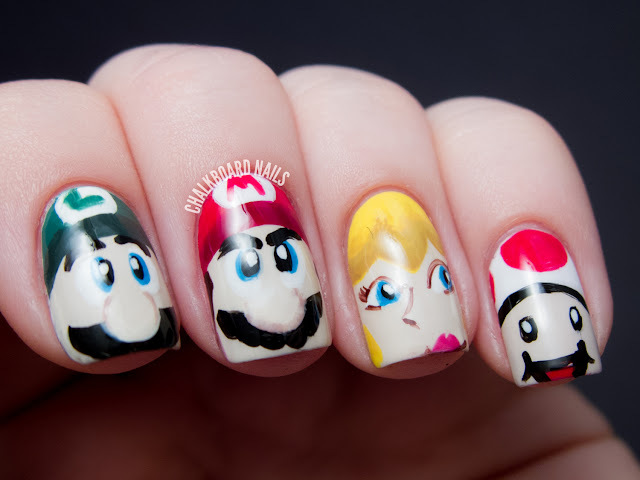 So that's my Mario nail art! I hope you enjoy it as much as I do! Which colors did you mix to make the darker yellow (on Peach's hair) and to outline the nose? OMG !! 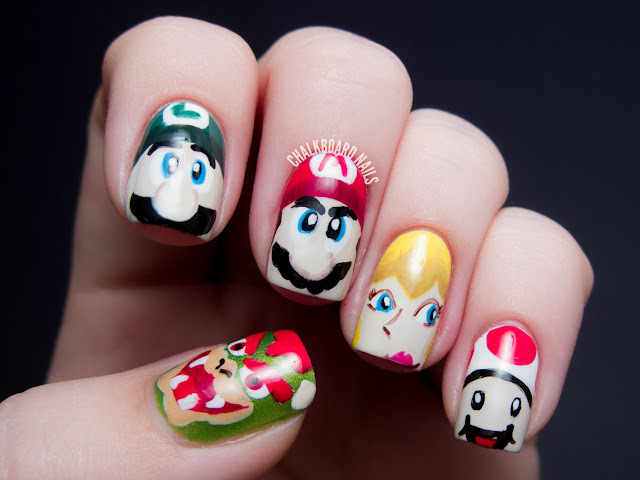 Very amzing nails !! 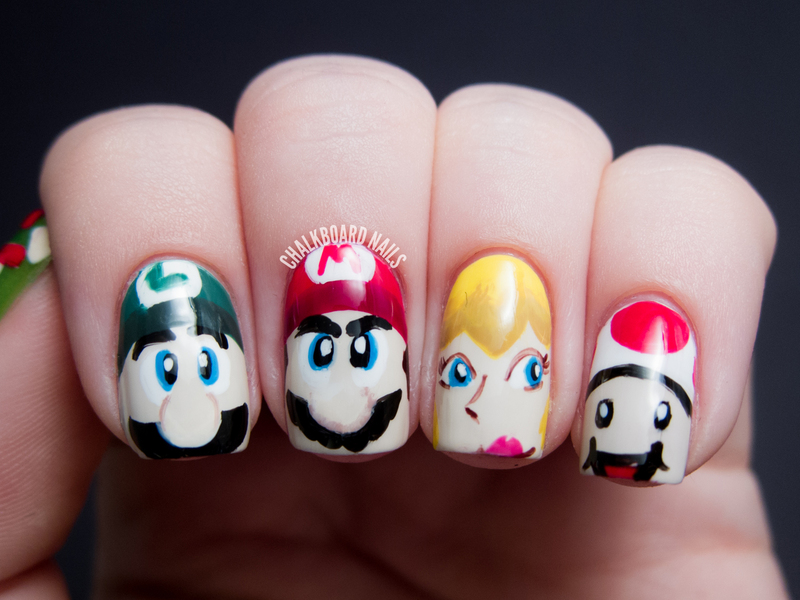 I think this is the coolest mani I have ever seen. This is SO cool! I mixed brown (China Glaze Call of the Wild) with the yellow in varying amounts for the shading, and then I used it straight up for the outlining. Just a little, to try to distinguish it from their mustaches! Amazing! You're awesome at everything Sarah. Do you ever use acrylic paint to do your nail art? WOW!! They are amazing!! You're very talented! who wouldnt enjoy this !? holy friggin crap !! Looks fantastic. My 2 boys will want me to recreate this (and they haven't a hope - I'm not talented enough!) 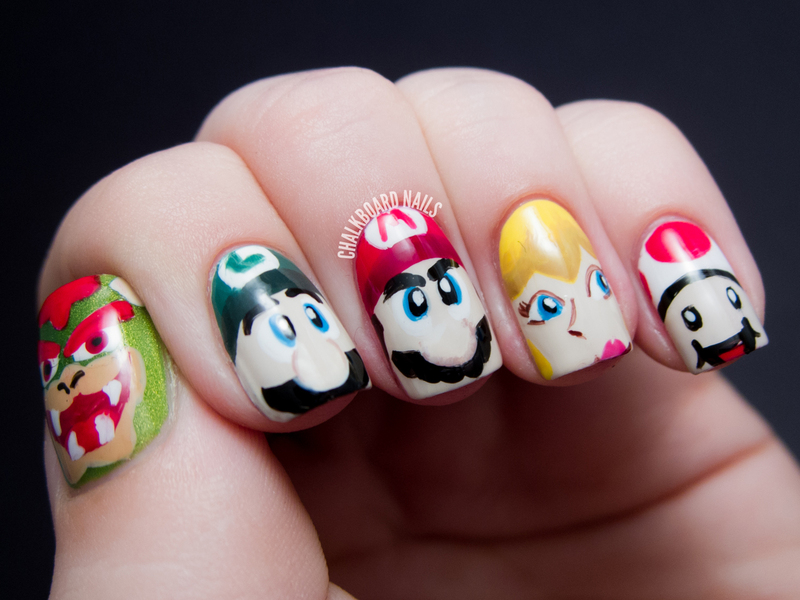 The fact you did it all in nail varnish is awesome. I love them all, but my favorite is Bowser! These are amazing!!! amazing job! my son is in love with this. amazing work! Incredible, you have amazing talent. I am stunned, this is incredible! I just found your blog on bloglovin and I'm a new fan. You're so talented :) What technique did you use to make this design? Did you use any specific nail brushes, dotting tools etc? You are unbelievably talented. !!!!!!!!!!!!!!!! ahhh i love this! so nerdy and amazing! 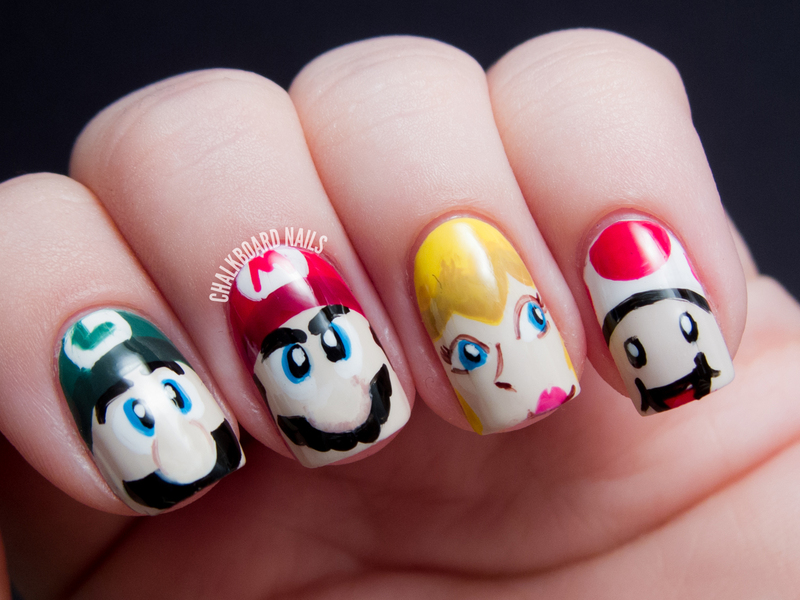 i like all, but my favorites are bowser & toad. Being a complete Mario addict, this is just so CUTE! VERY creative! It's awesome, I really like those characters and you painted them perfectly! My prefered one is Mario! They look really cool, well done! Maybe try Sonic and his friends? I was a Sonic girl when I was a teenager! Mario Party was the freaking bomb. 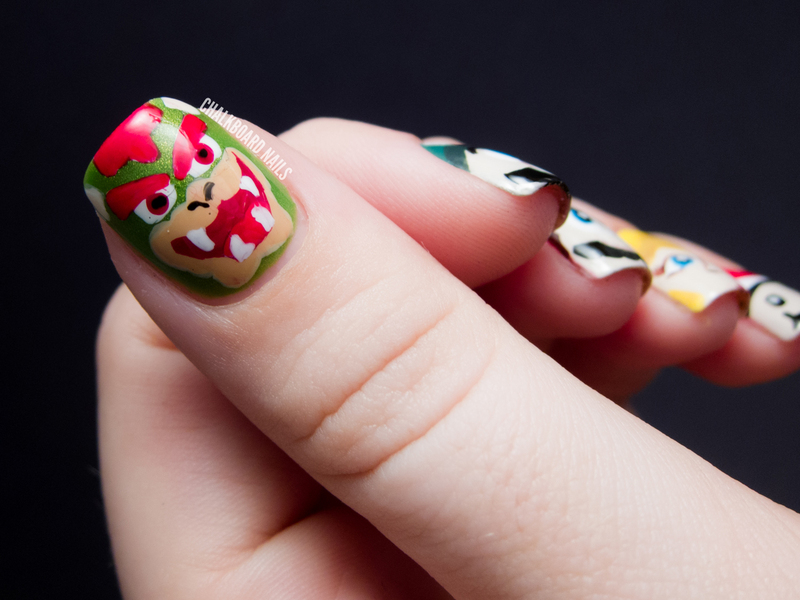 Your thumb REALLY makes me think of Bowser Face Lift hahahaha (...NOT because it isn't perfect, just because Bowser's face).